The following options enable us to change the settings of the Centreon architecture. 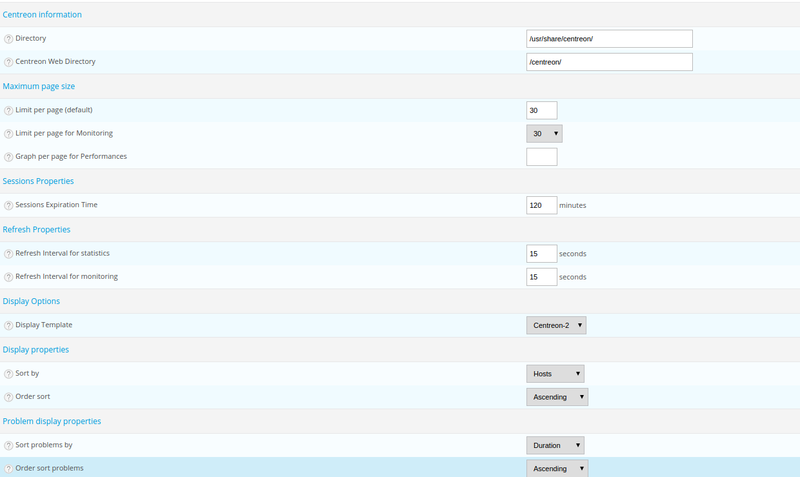 This part covers the configuration of the general options of the Centreon web interface. SSO mode field indicates if the authentication should take place only by SSO or using local authentication as well (Mixed). The mixed mode requires trusted client addresses. SSO trusted client addresses field indicates which are hte IP/DNS of the trusted clients (corresponding to the reverse proxy) for SSO. The trusted clients are separated by comas. SSO blacklist client addresses field indicates which are hte IP/DNS rejected. SSO login header field indicates the variables of the header that will be used as a login / pseudo (i.e HTTP_AUTH_USER). SSO pattern matching login field indicates the pattern to search for in the username. SSO pattern replace login field indicates the replace string. Timezone field indicates timezone of your monitoring server. SSO feature has only to be enabled in a secured and dedicated environment for SSO. Direct access to Centreon UI from users have to be disabled. The proxy configuration is mandatory to use CEntreon IMP offer. This part covers the general options of the real time monitoring interface. This part can be used set the operation of the CentCore process. Timeout value for Centcore commands field can be used to define a timeout for local commands and commands via SSH process. Illegal characters for Centcore commands field allows to define characters which will be removed from commands forwarded by the process.. If you want to use SSO for authentication, please read this procedure. This part can be used to configure the connection to LDAP directories. If the Auto import users option is checked, the LDAP settings of any new user who logs into the Centreon interface will automatically be imported into Centreon (name, first name, e-mail address, etc.). ACL profiles will be applied on access (link to ACL). However, if this option is not checked, only the users imported manually will be able to authenticate. Default contactgroup optional field, which is used to add a new user to a default contactgroup. Template list can be used to pre-configure the search filters for users on the LDAP directory. These filters serve to propose, by default, a search on the MS AD or of Posix type directories. Before any import, check the default settings proposed. If you have not selected a Model, you will need to define the search filters manually by filling in the fields. This part can be used to configure the RRDTool graphs generation engine. Go into the Administration > Parameters > RRDTool menu. TCP Port field defines the port on which RRDcached listens. Don’t enable RRDCacheD unless your monitoring platform encounters too many disk accesses concerning the writing of data in RRD files. Select only one option: TCP or Unix socket. 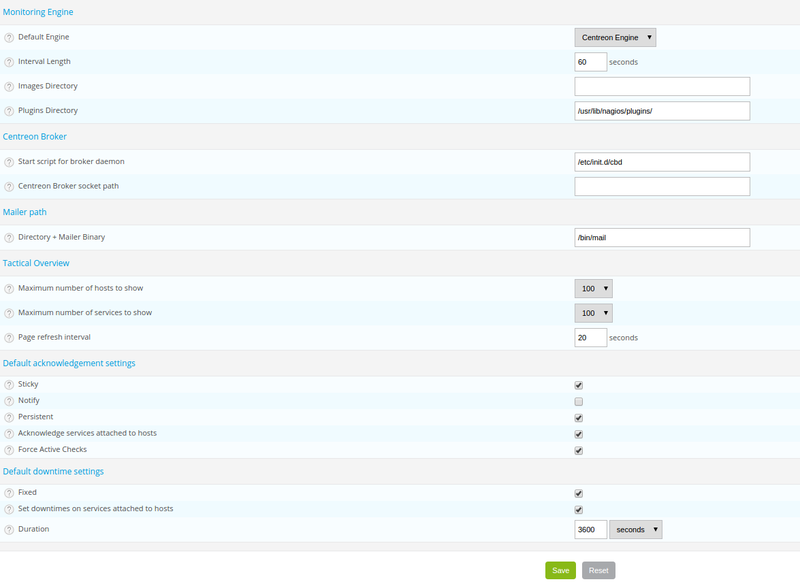 This part can be used to configure the enabling of the logging of activity on Centreon processes.